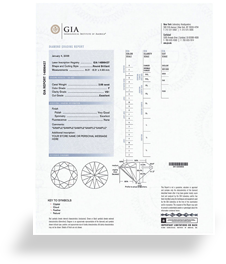 When buying a diamond, one of the most reliable tools you can use to determine the best value is the grading certificate that is supplied with each stone. A certificate tells you all about the diamond. Known also as diamond grading report, diamond dossier or simply a diamond certificate, it reports on the 4Cs of a particular diamond - color, clarity, cut and carat weight. It also displays a diagram of the diamond, noting all of the gem's relevant characteristics. The scales of color and clarity used to grade diamonds were developed by the Gemological Institute of America (GIA) some years ago, and all laboratories use this scale. However, it may come as a surprise to discover that, even with all of the parameters used to determine the value of diamonds, that diamond grading still has some subjective aspects to it. It is still part art and part science, and not all laboratories use the scale in precisely the same way. What one laboratory grades a diamond for color and clarity may not be what another laboratory grades that same diamond. So it is important to compare prices based on certificates - whenever possible - from the same laboratory. And your best bet is to use ones from a non-biased, third party laboratory.